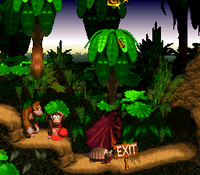 The Exit is the goal of each normal level in Donkey Kong Country. It is an open doorway, variously a cave entrance, stone porch or hole in a wall, marked by a small wooden sign with "EXIT" written on it in white paint, which allows Donkey Kong and Diddy Kong to move onto the next level. It also appears at the end of every level in DK: King of Swing. It does not appear in Donkey Kong Country 2: Diddy's Kong Quest or Donkey Kong Country 3: Dixie Kong's Double Trouble! and instead is replaced by the End of Level Target and Level Flag, respectively. It is also replaced by the Slot Machine Barrel in Donkey Kong Country Returns and Donkey Kong Country: Tropical Freeze. This page was last edited on February 28, 2019, at 01:26.